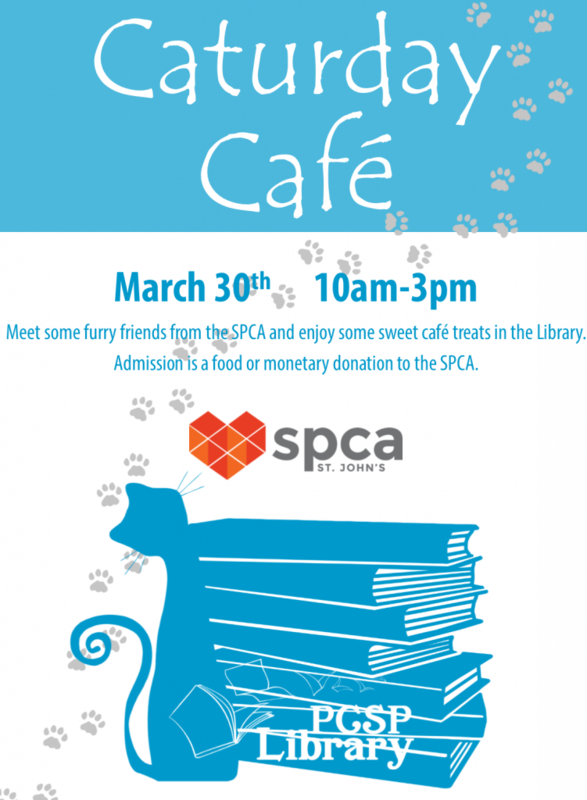 On Saturday, March 30th, 2019 the Town of Portugal Cove-St. Philip’s (PCSP) Library is excited to host its third “Caturday Café” in partnership with the SPCA St. John’s. At the event, the Library will be open for visitors to meet and read with a variety of adoptable cats and kittens. Similar to the Paws 4 Stories program in partnership with St. John Ambulance, which the PCSP Library was the first in the province to offer, participants are encouraged to come and read to a cat or kitten, or spend time with a cat or kitten while reading, as animals offer a non-judgmental audience, providing a safe ear to those readers who may be nervous. Just like Paws 4 Stories, in which readers are paired with dogs, the goal of the weekend Caturday Cafe program is to strengthen children’s reading skills through the physical and psychological benefits of animal-assisted therapy. The event takes place from 10:00 am to 3:00 pm in the PCSP Library, which is located at the rear entrance of the Town Office building at 1119 Thorburn Road. Admission is a food or monetary donation to the SPCA St. John’s. Everyone is welcome to visit and participate in the Town’s Library programming. The PCSP Library offers a range of events, programs, and books for people of all ages. Annual memberships are available for a cost of $5.00 per person or $15.00 per family.